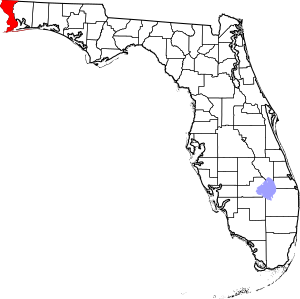 This is a list of the National Register of Historic Places listings in Escambia County, Florida. This is intended to be a complete list of the properties and districts on the National Register of Historic Places in Escambia County, Florida, United States. The locations of National Register properties and districts for which the latitude and longitude coordinates are included below, may be seen in a map. There are 38 properties and districts listed on the National Register in the county, including 3 National Historic Landmarks. Another 3 properties were once listed but have been removed. (#12000299) Junction of Scenic Bluffs Highway and Langley Ave.
(#16000245) 714 La Rua St.
(#14000389) 100 N. Palafox St.
(#75000552) 01990-10-10October 10, 1990 SW corner of Baylen and Belmont Sts. Pensacola Also known as Rafford Hall. Destroyed by arsonist in 1990. (#82002374) 01994-02-04February 4, 1994 1 N Palafox St.
National Register of Historic Places listings in Escambia County, Florida Facts for Kids. Kiddle Encyclopedia.